Retinal detachment (RD) is the final diagnosis for 3-4% of patients presenting to the Emergency Department (ED) with ocular complaints. Presenting symptoms most commonly include acute onset flashes and floaters, however, this presentation is not unique. The timely diagnosis and differentiation of RD from more common, benign, and similarly presenting processes, such as posterior vitreous detachment, is important in order to treat RD and prevent the sequela of permanent vision loss. Point of care ultrasound (POCUS) has been successfully employed in the diagnosis of retinal pathology with high degrees of success according to observed test characteristics (sensitivity 97%-100%; specificity 83-100%) in emergency medicine (EM) literature. The generalizability of this data is limited, however, due to study features, including the use of highly experienced sonographers, inconsistent scanning protocols, and poor reference standards. This investigation seeks to derive the test characteristics for POCUS in the diagnosis of RD when used by a heterogeneous population of emergency physicians (EPs). What are the test characteristics (sensitivity and specificity) of POCUS for the diagnosis of RD in patients presenting with chief complaint of flashes or floaters, when performed by a group of emergency physicians with varying degrees of ultrasound experience? 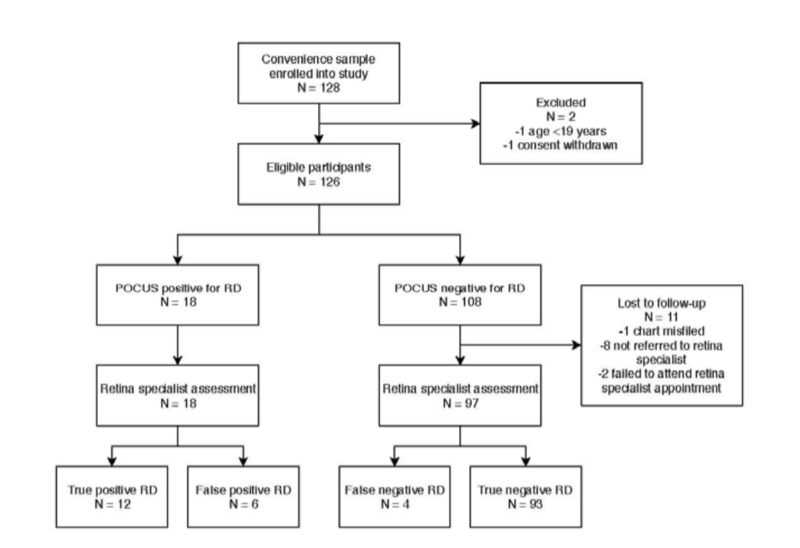 This study demonstrates that emergency physicians of varying training levels and ultrasound experience can successfully employ POCUS in the diagnosis of RD after only a short training session. By incorporating POCUS into the workup of patients presenting with ocular complaints characteristic of RD, true pathology can be identified with high specificity. Appropriate care can then be mobilized expeditiously in these scan-positive patients in order to prevent the permanent vision loss associated with this condition. Indeed, a 74% sensitivity is too low for POCUS to reliably be utilized by a heterogeneous population of EPs as a tool to rule-out RD, especially given the consequences of a missed diagnosis. It would be reasonable practice, therefore, as the authors suggest, for all patients with new onset flashes and/or floaters to continue be referred for further ophthalmologic evaluation to definitively rule-out RD and other conditions at-risk for progression to RD. It should also be noted, however, that a trend towards increased specificity was observed amongst physicians who enrolled more patients in this study. Taken in context with test characteristics reported in prior literature, these findings may suggest that specificity can be improved upon with experience, and in the hands of a trained sonographer, POCUS may also be used as a tool to reliably rule-out RD. Emergency providers can reliably use point-of-care ultrasound to diagnose retinal detachment with high specificity after a short, one-time training course, but must recognize the limitations of POCUS as a tool to rule-out RD in this setting, given a relatively low sensitivity when used for this purpose. This post was written by Oretunlewa Soyinka, MS4 at UCSD. Review and further commentary was provided by Cameron Smyres, MD, Ultrasound Fellow at UCSD. detachment in whites and Japanese. Ophthalmic Surg 1995; 26:39-43.
emergencies in a tertiary hospital in Central Saudi Arabia. Saudi Med J 2011; 32:1256-60.